Harlech. Now there’s a name to conjure with. One of the most famous castles in Wales if not the entire United Kingdom. 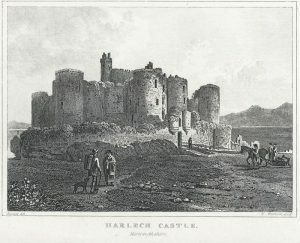 In contrast to Bodiam last week, Harlech was the site of conflict from before it was built up until its partial destruction in the English Civil War. There is even a song about one of the sieges of the place! Despite going to university just up the road in Bangor i am sad to say I never managed to visit Harlech. It’s a small castle, and comparatively cheap by the standards of the day – it cost around eight thousand pounds, while Conwy cost fifteen thousand, and Caernarfon was over twenty thousand – all three were built around the same time and all in North Wales. All three of these, and five others others, were built on the orders of Edward I towards the end of the Thirteenth Century to try to prevent another Welsh uprising – a conflict that had been bubbling for at least two hundred years by this point.